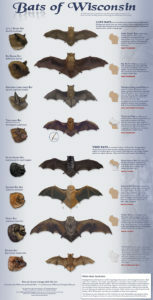 183 species are illustrated life size. 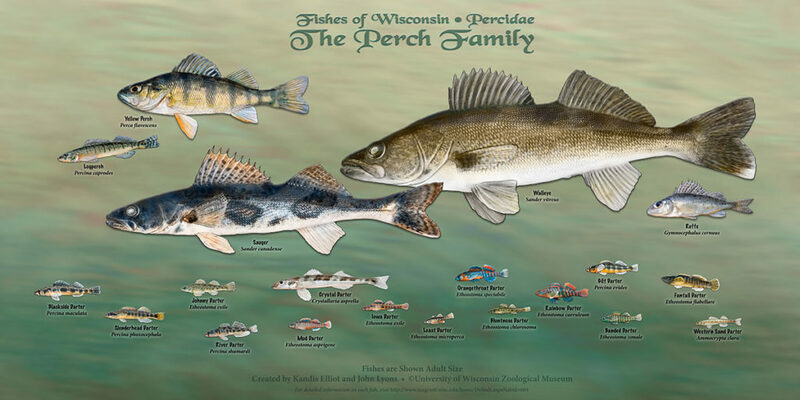 From the tiny Least Darter to the giant Lake Sturgeon, natives and exotics, they are all here, including some species that are just venturing into Wisconsin waters, and some that are sadly almost extinct. 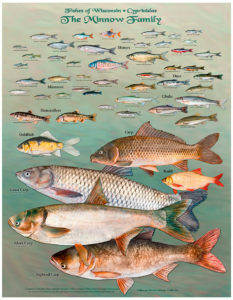 This 44 inch x 13 foot poster is printed with archival inks on exhibition quality canvas. Created by Kandis Elliot, UW Senior Artist Emerita. 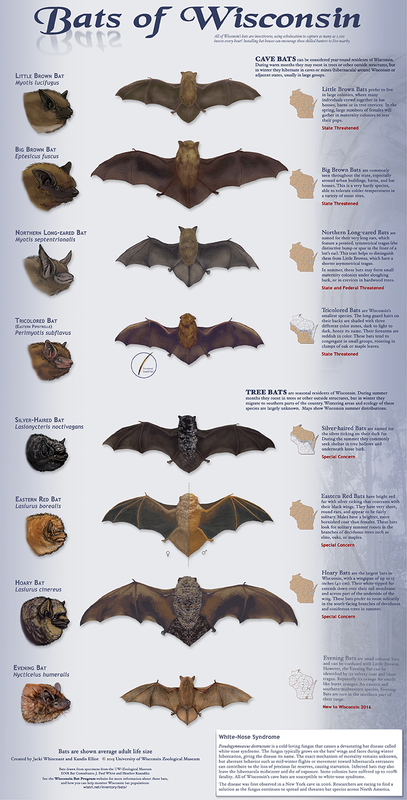 Photo references provided by John Lyons, Wisconsin Department of Natural Resources. Biologically, mussels and clams have their differences, but colloquially we call them all “clams.” We illustrate our 58 Wisconsin species, including exotics, at adult life size. Each species reveals its unique beauty, shape, and identifying features. Sadly, illustrations may be all you ever see of some of these vital environmental-health indicators. At least two species are considered extinct, and many more are threatened or endangered. This 44 inch x 10 foot poster is printed with archival inks on exhibition quality canvas. We’ve schooled our fishes into smaller groups for Fish Family aficionados, and folks with smaller walls. 16 Families are represented by their smallest members. If you’ve ever gazed into a stream or shoreline, you probably saw these little guys as darting shadows. What’s the difference between minnows and shiners? Chubs and chubsuckers? 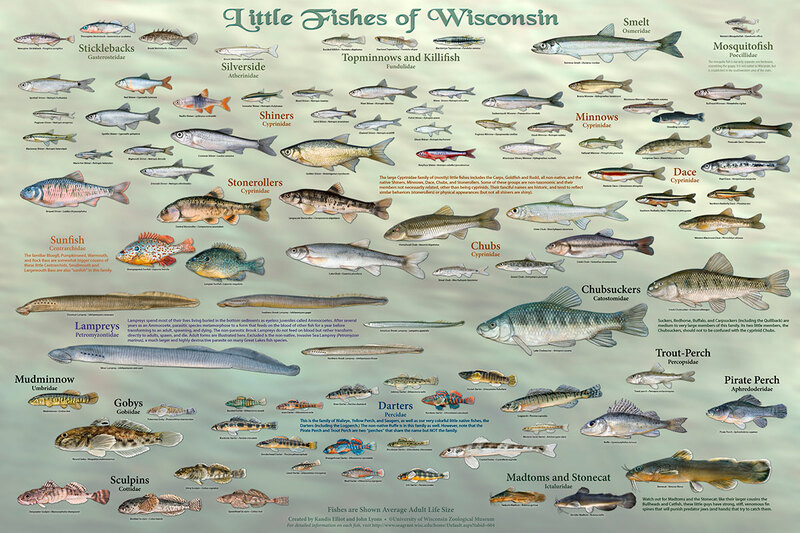 We address these questions and provide other interesting tidbits about Wisconsin’s littlest fishes. 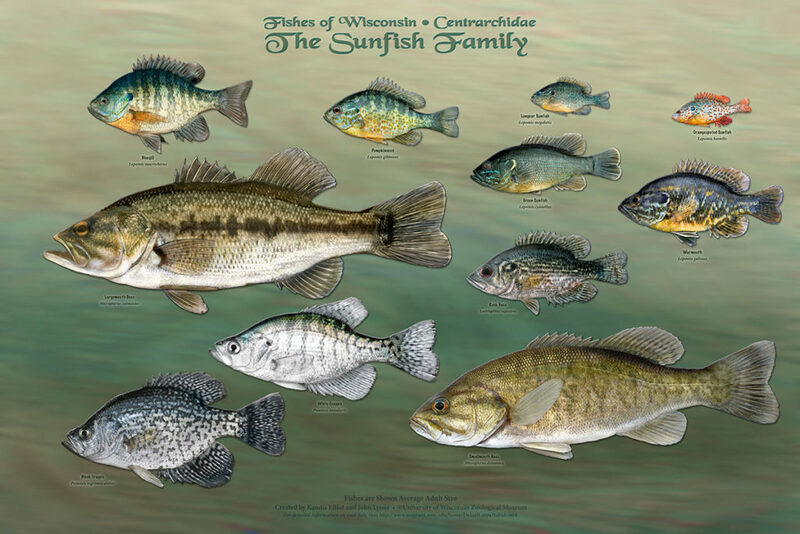 This could also be called the Bass Family, because it includes the well-known Largemouth and Smallmouth Bass. It also includes the bluegill, the “first fish” of many a young angler. Yellow Perch and Walleye are well-known members of this family, but so are 15 little Darters, many of which are Wisconsin’s most colorful fish. All 3 members of the Pike Family are aggressive predators. 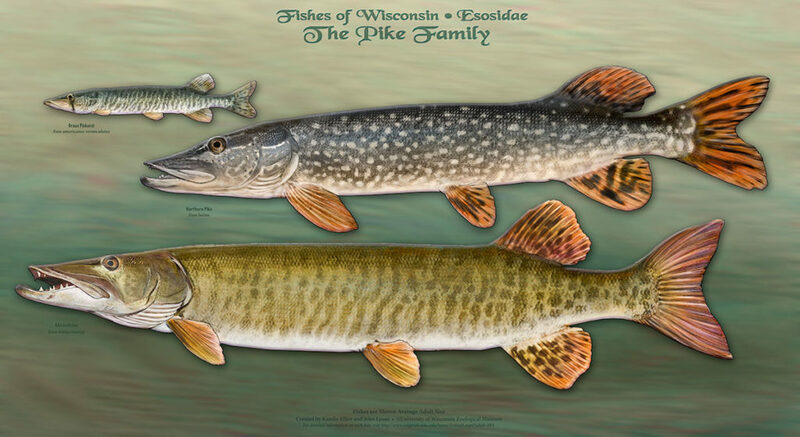 The Northern Pike and Muskellunge are highly sought-after game fish. The Pickerel rules in slow, warm waters and marshes. An array of “whiskers” and fin spines make catfish immediately recognizable, from the huge Flathead and prevalent Bullheads, to the tiny Madtoms. We included the spotted gar, an occasional southern visitor, among these stealth hunters. Warming waters may bring several more southern species of fishes into the state. Illustrated at 80% life size. Our most important game and commercial fishes are represented in the Salmon Family. We included all of Wisconsin’s introduced species, and a few of our rarest such as the Black Cisco, now probably extinct due to overfishing. 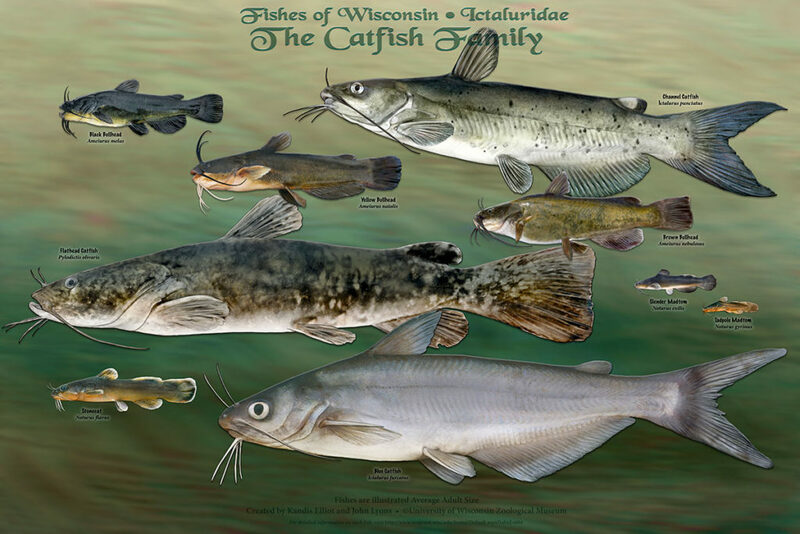 Wisconsin has a lot of Sucker Family representatives, including Redhorse, Buffalo, Carpsuckers and Chubsuckers, as well as Suckers.We had to reduce them a little to fit them all on a manageable poster. Big lips and big scales are general features of these fishes. The Clean Water Act of 1972 and recent dam removals have benefited fish species that undergo seasonal spawning runs up tributary streams along the shores of Great Lakes states. We have schooled river-run species from our Fishes of Wisconsin poster, and added one from Michigan, to create this poster featuring the 54 migratory fishes from the Great Lakes. Illustrated life size. This 44 inch x 10 foot poster is printed with archival inks on exhibition quality canvas. Doing Business As The charge will appear on your credit card statement as UW-Zoological Museum. Refund Policy If you are not satisfied with your products, please contact Kandis Elliot, keelliot@wisc.edu, (608) 262-3766 to arrange a refund. Privacy Statement UW-Madison does not sell, rent, trade or distribute any personally identifiable information obtained from clients to a third party, except in cooperation with government agencies or as required by law. Information collected by the UW-Madison is used for the administrative and operational purposes of our services. This site was built using the UW Theme. © 2018 Board of Regents of the University of Wisconsin System.